"Bourne 4" redirects here. For the novel, see The Bourne Legacy (novel). The Bourne Legacy is a 2012 American action thriller film directed by Tony Gilroy, and is the fourth installment in the series of films adapted from the Jason Bourne novels originated by Robert Ludlum and continued by Eric Van Lustbader, being preceded by The Bourne Identity (2002), The Bourne Supremacy (2004), and The Bourne Ultimatum (2007). Although this film has the same title as Van Lustbader's first Bourne novel, The Bourne Legacy, the actual screenplay bears little resemblance to the novel. Unlike the novel, which features Jason Bourne as the principal character, the film centers on black ops agent Aaron Cross (played by Jeremy Renner), an original character. In addition to Renner, the film stars Rachel Weisz and Edward Norton. The titular character Jason Bourne does not appear in The Bourne Legacy, as actor Matt Damon chose not to return for the fourth film, due to Paul Greengrass not directing. Bourne is shown in pictures and mentioned by name several times throughout the film. Tony Gilroy, co-screenwriter of the first three films, sought to continue the story of the film series without changing its key events, and parts of The Bourne Legacy take place at the same time as the previous film, The Bourne Ultimatum (2007). Aaron Cross is a member of a black ops program called Operation Outcome whose subjects are genetically enhanced. He must run for his life once former CIA Treadstone agent Jason Bourne's actions lead to the public exposure of Operation Treadstone and its successor Operation Blackbriar. Filming was primarily in New York City, with some scenes shot in the Philippines, South Korea, Pakistan, and Canada. Released on August 10, 2012, the film received mixed reviews, with critics praising the story, James Newton Howard's score, and Renner's performance, but expressing disappointment in Matt Damon's absence, as well as the lack of shaky camera work (a key element of Greengrass' directorial style) that the second and third films had used. The film was followed in 2016 by Jason Bourne, in which Damon and Greengrass reprised their earlier roles. Six weeks after Jason Bourne's escape from Moscow in The Bourne Supremacy, Aaron Cross, an operative belonging to a Department of Defense black ops program called Operation Outcome, is assigned to Alaska for a training exercise. He is forced to survive weather extremes and traverse rugged terrain to arrive at a remote cabin as punishment for missing training and going off the grid for four days. The cabin is operated by an exiled Outcome operative, Number Three, who informs Cross that he has broken the mission record by two days. As an Outcome operative, Cross uses experimental pills known as "chems" which enhance the physical and mental abilities of their users. After the Treadstone and Blackbriar programs are exposed, retired Air Force colonel Eric Byer is tasked with containing the fallout. He discovers a potentially scandalous video on the Internet showing a meeting between Treadstone and Outcome medical directors. To prevent the Senate investigation from learning about Outcome, Byer orders everyone associated with the program killed. He sees the sacrifice as acceptable to protect next-generation "beta programs", including the supersoldier program LARX. Byer deploys a drone to eliminate Outcome agents Number Three and Five (Cross) in Alaska. Cross evades the drone and force-feeds his radio-frequency identification to a wolf which is then blown up by a missile, tricking Byer into believing Cross is dead. At Sterisyn-Morlanta, a biogenetics company supporting Outcome, researcher Dr. Donald Foite shoots and kills all but one of his colleagues in the research laboratory. After being cornered by guards, Foite turns his gun on himself, leaving biochemist Dr. Marta Shearing as the sole survivor. Other Outcome agents are eliminated when their handlers give them poisoned yellow pills disguised as new chems. Four "D-Trac" assassins disguised as federal agents visit Shearing at her country house. When she states her belief of Foite having been chemically brainwashed into an emotionless killer, the assassins attempt to fake her suicide, but are killed by Cross. Shearing reveals that Cross has been genetically modified by a tailored virus to retain the physical benefits permanently without needing the green chems anymore. He still requires regular doses of blue chems to maintain his intelligence, but he is running out. Cross confides to her that he is Private First Class Kenneth J. Kitsom (reportedly killed by an improvised explosive device in the Iraq War) and that his recruiter added twelve points to his IQ, enabling Cross to meet the United States Army's requirements. Without his enhanced intelligence, Cross believes they stand no chance of survival. Cross and Shearing travel to Manila, where the chems are manufactured, to try to infect him with another virus that will make his intelligence permanent. Cross and Shearing bluff their way into the Morlanta Pacific pharmaceutical factory and Shearing injects Cross with the live virus stems. Byer alerts factory security, but they evade capture. Byer orders LARX-03, a chemically-brainwashed supersoldier, to track and kill them. As Cross is struck by flu-like symptoms induced by the virus, he hallucinates about his Outcome training. When police surround their shelter while Shearing is buying medicine, Cross rescues her and steals a motorbike. After a lengthy chase through the streets and marketplaces of Manila to Marikina, they lose the police and kill the assassin. Shearing persuades a Filipino boatman to help them escape by sea. Back in New York, Blackbriar supervisor Noah Vosen lies to the Senate, stating that Blackbriar was created solely to track down Jason Bourne, and that Deputy Director Pamela Landy committed treason by assisting Bourne and trying to sell Treadstone secrets to the press. Universal Pictures originally intended The Bourne Ultimatum to be the final film in the series, but development of another film was under way by October 2008. George Nolfi, who co-wrote The Bourne Ultimatum, was to write the script of a fourth film, not to be based on any of the novels by Robert Ludlum. Joshua Zetumer had been hired to write a parallel script—a draft which could be combined with another (Nolfi's, in this instance)—by August 2009 since Nolfi would be directing The Adjustment Bureau that September. Matt Damon stated in November 2009 that no script had been approved and that he hoped that a film would begin shooting in mid-2011. The next month, he said that he would not do another Bourne film without Paul Greengrass, who announced in late November that he had decided not to return as director. In January 2010, Damon said that there would "probably be a prequel of some kind with another actor and another director before we do another one just because I think we're probably another five years away from doing it." However, it was reported in June 2010 that Tony Gilroy, who co-wrote each of the three previous Bourne films, would be writing a script with his brother, screenwriter Dan Gilroy, for a fourth Bourne film to be released sometime in 2012. That October, Universal set the release date for The Bourne Legacy for August 10, 2012, Tony Gilroy was confirmed as the director of the film, and it was also announced that Jason Bourne will not be appearing in The Bourne Legacy. Gilroy said he did not get involved with the project "until the rules were that Matt [Damon] was gone, Matt and Paul [Greengrass] were gone, there was no Jason Bourne. That was the given when I had the first conversation about this. So it was very important to me, extremely important to me, that everything that had happened before be well preserved and be enhanced if possible by what we're doing now." He also said, "you could never replace Matt [Damon] as Jason Bourne. This isn't James Bond. You can't do a prequel. You can't do any of those kinds of things, because there was never any cynicism attached to the franchise, and that was the one thing they had to hang on to." Gilroy "never had any intention of ever coming back to this realm at all—much less write it, much less direct it. Then I started a really casual conversation about what we could do in a post-Jason Bourne setting. I was only supposed to come in for two weeks, but the character we came up with, Aaron Cross, was so compelling." After watching The Bourne Ultimatum again, Gilroy called his brother, screenwriter Dan Gilroy, and said, "'The only thing you could do is sort of pull back the curtain and say there's a much bigger conspiracy.' So we had to deal with what happened in Ultimatum as the starting point of this film. Ultimatum plays in the shadows of Legacy for the first 15 minutes—they overlap." Although a large part of the film was set in and around Washington, DC, the real DC appears only in aerial establishing shots. Most of the film was shot over 12 weeks at the Kaufman Astoria Studios in Queens, New York, including all interior DC scenes. The old house in Hudson, New York, used as Shearing's house was unable to accommodate the weight of equipment and crew, so it was used only for exterior shots, and all interior scenes were filmed on a Kaufman Astoria soundstage. The scenes set in the "SteriPacific" factory in Manila were actually filmed in the New York Times printing plant in Queens. El Nido, Palawan in the Philippines served as a filming location, and in the film, was used as escape route from Manila. Several scenes were shot overseas, mostly in Manila and in the Paradise bay of El Nido, Palawan, in the Philippines. Several train scenes at Garak Market Station on Seoul Subway Line 3 and nearby areas in Seocho-daero 77-Gil (1308 Seocho 4-dong), Seocho-gu, and Gangnam-gu, Seoul, South Korea, were used in some scenes. The Kananaskis Country region of Alberta, Canada, was used for the scenes set in Alaska. Gilroy said, "there are three deleted scenes—we just mixed them and color corrected them [...] but what I like about it is all three scenes happen in the movie. One of them's referred to and they're completely legitimate parts of our story, they absolutely happen in our film, we just didn't have time to show them to you so there's nothing off to the side. I think they'll be on the straight-up DVD." The film portrays Cross and Shearing as traveling nonstop from New York JFK Airport to Manila on board an American Airlines Boeing 747-400. That particular 747 model was introduced in 1989; American Airlines has never flown one; American Airlines has never served Manila as a destination; no commercial airline has ever flown from JFK to Manila nonstop with passenger service; the distance between the two cities exceeds the maximum range of any model 747. In spite of these continuity lapses, American Airlines was actively involved in the production of the film in cooperation with NBCUniversal, and contributed its own airline employees and a Boeing 777-200 for the interior terminal and cabin shots at Terminal 8 of JFK International Airport. The airline also heavily co-marketed the film throughout post-production. The Bourne Legacy premiered in New York City on July 30, 2012. It had its Asian premiere at Resorts World Manila in Pasay City, Metro Manila, on August 5, 2012, before its release in North America on August 10. In its opening weekend, The Bourne Legacy grossed about $38.7 million in the United States and Canada and debuted at #1 of the box office charts, surpassing Universal's expectation of $35 million. It grossed $46.6 million worldwide in its first weekend. The film sold roughly 400,000 more tickets on its opening weekend than the first film in the series, The Bourne Identity. Studio research reported that audiences were evenly mixed among the sexes. The film grossed $113,203,870 in North America and $162,940,880 in foreign countries, bringing the film's worldwide total to $276,144,750. The Bourne Legacy received mixed reviews from critics. On Rotten Tomatoes the film has an approval rating of 60% based on 219 reviews with an average rating of 5.9/10. The site's critical consensus reads, "It isn't quite as compelling as the earlier trilogy, but The Bourne Legacy proves the franchise has stories left to tell—and benefits from Jeremy Renner's magnetic work in the starring role." On Metacritic, the film has a score of 61 out of 100 based on 42 critics, indicating "generally favorable reviews". Audiences polled by CinemaScore gave the film an average grade of "B" on an A+ to F scale. Lisa Schwarzbaum of Entertainment Weekly gave the film an A-, commenting that "Gilroy, who as a screenwriter has shaped the movie saga from the beginning, trades the wired rhythms established in the past two episodes by Paul Greengrass for something more realistic and closer to the ground. The change is refreshing. Jason Bourne's legacy is in good hands." Roger Ebert of the Chicago Sun-Times gave the film 2½ stars out of 4, writing: "The Bourne Legacy is always gripping in the moment. The problem is in getting the moments to add up. I freely confess that for at least the first 30 minutes I had no clear idea of why anything was happening. The dialogue is concise, the cinematography is arresting and the plot is a murky muddle." Peter Debruge of Variety wrote that "the combination of Robert Elswit's elegant widescreen lensing and the measured editing by Tony Gilroy's brother John may be easier to absorb than Greengrass' hyperkinetic docu-based style, but the pic's convoluted script ensures that auds will emerge no less overwhelmed." Michael Atkinson of The Village Voice also wrote a scathing review of the film, saying: "The Bourne films have more than just overstayed their welcome and outlasted the Ludlum books—they've been Van Halenized, with an abrupt change of frontman and a resulting dip in personality." Kenneth Turan of the Los Angeles Times gave the film a positive review, called the film "an exemplary espionage thriller that has a strong sense of what it wants to accomplish and how best to get there." He especially commended Gilroy's work on the film: "Gilroy knows the underpinnings of this world inside out and appreciates how essential it is to maintain and extend the house style of cool and credible intelligence that marked the previous films." Todd McCarthy of The Hollywood Reporter commented on his review that "the series' legacy is lessened by this capable but uninspired fourth episode." The Bourne Legacy was released on DVD and Blu-ray on December 11, 2012, in the United States and Canada. The soundtrack to The Bourne Legacy as composed by James Newton Howard, unlike the previous films, which were composed by John Powell, was released digitally on August 7, 2012, by Varèse Sarabande Records. A new version of Moby's "Extreme Ways", entitled "Extreme Ways (Bourne's Legacy)", was recorded for the film's end credits. Universal Pictures stated at a media conference in Los Angeles, California, that they are likely to release more Bourne films, despite The Bourne Legacy being given mixed reviews by critics. In a December 2012 interview, Matt Damon revealed that he and Paul Greengrass were interested in returning for the next film as Jason Bourne and the director, respectively. Damon is reported saying that although he had not seen Legacy, he intends to do so because not only is he curious to see it, but also because he has enjoyed Jeremy Renner in everything he has seen him in. However, as of June 2014, executive producer Frank Marshall said that Matt Damon will not be returning to the big screen for the next Bourne film, contrary to earlier statements made by Damon and rumors surrounding his return to the franchise. On February 21, 2013, it was confirmed that a Bourne 5 was being planned. On August 2, 2013, Universal hired Tony Gilroy and Anthony Peckham to write the film's script with Renner returning as Cross. On November 8, 2013, The Fast and the Furious film series director Justin Lin was announced to direct the film. On December 2, 2013, it was announced that Renner will return as Cross, Lin will both direct and produce from his production company Perfect Storm Entertainment, and the studio announced an August 14, 2015 release date. On May 9, 2014, Andrew Baldwin was brought in to re-write the film. On June 18, 2014, the studio pushed back the film from August 14, 2015, to July 15, 2016. In November 2014, the Bourne Legacy sequel was put on hold in favor of Jason Bourne, which Damon confirmed that he and Greengrass would return to. On January 6, 2015, the studio pushed back the release date to July 29, 2016. The first trailer for the film was aired on February 7, 2016 during Super Bowl 50, which also revealed its title as Jason Bourne. The film premiered in the United States on July 29, 2016 to mixed reviews. Producer Frank Marshall said Universal Pictures is hoping to plan a sequel to Jason Bourne, making it the sixth Bourne film. He also stated that a sequel to The Bourne Legacy featuring Renner's Cross is unlikely, although he did not explicitly rule it out. However, in March 2017, Matt Damon cast doubt upon a sequel, hinting that people "might be done" with the character. ^ "The Bourne Legacy". British Board of Film Classification. July 23, 2012. Retrieved August 12, 2012. ^ a b c d "The Bourne Legacy". Box Office Mojo. Retrieved October 8, 2012. ^ a b Fleming, Michael (October 16, 2008). "Universal moves ahead with 'Bourne'". Variety. Retrieved October 20, 2008. ^ Kit, Borys (August 21, 2009). "Next 'Bourne' lands scribe". Film Journal International. Retrieved July 11, 2012. ^ "Exclusive Matt Damon Interview". TotalFilm.com. November 12, 2009. p. 6. Retrieved November 22, 2009. ^ Sperling, Nicole (December 4, 2009). "Matt Damon on 'Bourne 4': 'I wouldn't do it without Paul Greengrass'". Entertainment Weekly. Archived from the original on December 6, 2009. Retrieved December 5, 2009. ^ Hewitt, Chris (February 1, 2010). "Will The Next Bourne Be A Prequel?". Empire. Retrieved June 30, 2010. ^ Sperling, Nicole (June 9, 2010). "Tony Gilroy penning a fourth 'Bourne' script". Entertainment Weekly. Archived from the original on June 15, 2010. Retrieved June 30, 2010. ^ "Universal Sets Release Dates Through 2013". October 29, 2010. Retrieved October 29, 2010. ^ "No Matt Damon in Bourne Legacy". Entertainment Weekly. October 11, 2010. Archived from the original on February 4, 2012. Retrieved October 11, 2010. ^ a b Weintraub, Steve (August 12, 2012). "Writer/Director Tony Gilroy Talks THE BOURNE LEGACY, Deleted Scenes, the Franchise Going Forward, His Thoughts on IMAX and More". Collider. Retrieved September 4, 2012. ^ Hornaday, Ann (August 10, 2012). "Tony Gilroy talks about the fractious, entertaining, lucrative ride of 'Bourne'". The Washington Post. Retrieved September 5, 2012. ^ a b Abrahams, Stephanie (August 8, 2012). "Director Tony Gilroy on the 'Epic' Bourne Legacy". Time. Retrieved September 4, 2012. ^ Perez, Rodrigo (August 9, 2012). "Interview: Tony Gilroy Talks The Challenges Of Mounting 'The Bourne Legacy,' Addresses The 'Enhancement' Concerns & More". The Playlist. Retrieved September 4, 2012. ^ a b c Universal Studios, The Bourne Legacy: Production Notes. Retrieved September 9, 2012. ^ Lugay, Elton (August 16, 2012). "Filipinos in 'Bourne Legacy:' Very patient, always punctual". Inquirer. Retrieved September 9, 2012. ^ "Manila streets closed for Bourne". MB.com. Retrieved August 2, 2012. ^ Cruz, Marinel R. (January 11, 2012). "'Bourne Legacy' movie starts filming in the heart of Manila". Philippine Daily Inquirer. Retrieved July 19, 2012. ^ "'Bourne Legacy' Puts Seoul on Hollywood Radar". Chosun Ilbo. June 28, 2012. Retrieved June 28, 2012. ^ "Boeing: Commercial Airplanes - 747-400 Comprehensive Background". Retrieved February 4, 2013. ^ "Historic American Airlines Aircraft Models". Archived from the original on December 17, 2012. Retrieved February 4, 2013. ^ "Boeing: Commercial Airplanes - 747 Range Chart". Retrieved February 4, 2013. ^ "American Airlines Celebrates Universal Pictures' The Bourne Legacy By Unveiling Covert Content To Customers". Retrieved February 4, 2013. ^ Interaksyon (July 19, 2012). "VIDEO: "Mga kapitbahay, mga bro!" Bourne Legacy clip raises anticipation with tagalog scenes". InterAksyon.com. Retrieved July 19, 2012. ^ Pandya, Gitesh (August 12, 2012). "Box Office Guru Wrapup: Bourne Kills the Batman". Rotten Tomatoes. Retrieved August 13, 2012. ^ "The Bourne Legacy". rottentomatoes.com. ^ "The Bourne Legacy". Metacritic. Retrieved August 19, 2012. ^ "CinemaScore". Retrieved August 24, 2017. ^ Schwarzbaum, Lisa (August 8, 2012). "'The Bourne Legacy' Review". Entertainment Weekly. Retrieved August 9, 2012. ^ Debruge, Peter (August 6, 2012). "Variety Reviews: 'The Bourne Legacy'". Variety. Retrieved August 24, 2017. ^ Atkinson, Michael (August 8, 2012). "'The Bourne Legacy': Who's the New Guy?". The Village Voice. Retrieved August 24, 2017. ^ Turan, Kenneth (August 9, 2012). 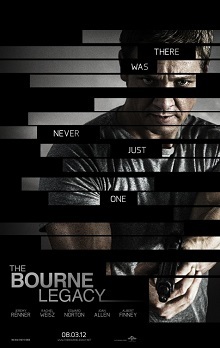 "Review: 'The Bourne Legacy' lives up to its predecessors". Los Angeles Times. Retrieved August 24, 2017. ^ McCarthy, Todd (August 6, 2012). "'The Bourne Legacy': Film Review". The Hollywood Reporter. Retrieved August 24, 2017. ^ "The Bourne Legacy Blu-ray and DVD". Blu-ray.com. September 3, 2012. ^ (November 14, 2011). "James Newton Howard to Score 'The Bourne Legacy'". FilmMusicReporter.com. Retrieved July 27, 2012. ^ (June 12, 2012). "Varese Sarabande to Release 'The Bourne Legacy' Soundtrack". FilmMusicReporter.com. Retrieved July 27, 2012. ^ "Moby records new version of 'Extreme' closing theme for upcoming 'Bourne Legacy'". NY Daily News. August 1, 2012. Retrieved March 6, 2016. ^ "Bourne Legacy sequel confirmed". BBC News. September 14, 2012. Retrieved August 18, 2013. ^ "Matt Damon: Door is still open for more 'Bourne'". MSN. December 16, 2012. Retrieved August 18, 2013. ^ "Matt Damon Not Coming Back for Next Bourne Movie". E! Online. June 20, 2014. ^ Schaefer, Sandy (2013). "'Bourne 5' and 'Snow White' Sequel Updates; 'Fifty Shades of Grey' in Summer 2014?". Screenrant.com. Retrieved August 18, 2013. ^ Plumb, Ali (February 21, 2013). "Universal Boss Talks Up Bourne 5". Empire. Retrieved August 18, 2013. ^ Fleming, Mike Jr. (August 2, 2013). "New 'Bourne' Chapter In Works At Universal For Jeremy Renner's Aaron Cross Character". Deadline.com. Retrieved August 18, 2013. ^ Fleming, Mike Jr. (November 8, 2013). "'Fast & Furious' Helmer Justin Lin To Direct Next 'Bourne' Installment". deadline.com. Retrieved February 19, 2018. ^ Team, The Deadline (December 2, 2013). "Justin Lin's 'Bourne' Gets August 2015 Release". Deadline.com. ^ Kit, Borys (May 8, 2014). "'Bourne Legacy' Sequel Nabs a New Writer". The Hollywood Reporter. Retrieved August 24, 2017. ^ Ford, Rebecca; McClintock, Pamela (June 18, 2014). "Next 'Bourne' Movie Delayed Until 2016". The Hollywood Reporter. Retrieved August 24, 2017. ^ Agar, Chris (November 8, 2014). "Matt Damon Confirms New 'Bourne' for 2016". screenrant.com. Retrieved August 24, 2017. ^ "Next Bourne Movie Takes Planet of the Apes' Vacated Spot". Coming Soon.net. January 6, 2015. Retrieved August 24, 2017. ^ McMillan, Graeme (February 8, 2016). "'Jason Bourne' Super Bowl 50 Trailer Brings Matt Damon's Super Spy Out of Retirement". The Hollywood Reporter. Retrieved August 24, 2017. ^ Han, Angie (November 29, 2016). "'Jason Bourne' Sequel Likely to Happen, 'Bourne Legacy' Sequel Less Likely to Happen". /Film. Retrieved February 19, 2018. ^ Daniel, Mark (March 5, 2017). "Matt Damon hints maybe people are done with Jason Bourne". Toronto Sun. Retrieved February 19, 2018. Wikimedia Commons has media related to The Bourne Legacy (film).